Remember when Kyuss broke up? 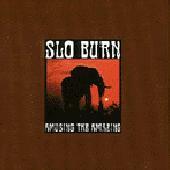 Well, after the dissolution of Kyuss, vocalist John Garcia formed Slo Burn. Slo Burn only managed to exist for about a year so from Fall 1996 to Summer 1997. Aside from a few tour dates with OzzFest '97, those twelve months were enough to record and release four songs under the title "Amusing The Amazing." Twelve months is barely enough time to register on the musical radar screen and Slo Burn have faded into obscurity. One of my chief complaints about Kyuss was that Garcia's vocals managed to get lost in nearly every song and it wasn't something that I couldn't blame on the production or mixing. If "Amusing The Amazing" was the only highlight of this short-lived project then it may only serve as definitive proof that Garcia's vocals disappeared into the Bermuda Triangle musical ether of his projects. Slo Burn's sound is not unlike any other stoner band that you might have heard. "The Prizefighter" is a bit more up-tempo than most of Kyuss' material while "Muezli" puts Slo Burn back in the mid-paced sludge territory that revels in its sun-baked nature. Both "Pilot The Dune" and "July" let vocalist Garcia shine (relatively speaking) with more Kyuss-inspired hypnotic stoner rock. Fans of the stoner genre will want to get their hands on this hard-to-find item. "Amusing The Amazing" was produced by Chris Goss (Masters Of Reality) and Slo Burn. Slo Burn is John Garcia on vocals, Chris Hale on guitars, Damon Garrison on bass, and Brady Houghton on drums. Revised: 29 Jan 2019 02:25:11 -0500.